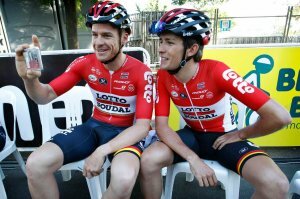 Former DIS athlete James Shaw (right) has progressed to cycle professionally for the Lotto Soudal team. The Derbyshire Institute of Sport (DIS) was set up by Derbyshire Sport alongside funding partners Derby City Council, Derbyshire County Council and the University of Derby in April 2012 with the aim of helping the cream of Derbyshire's athletes reach the top. 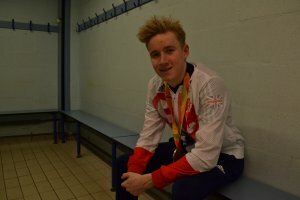 It was set up in a bid to instill a legacy following the 2012 London Olympic Games and with a goal to provide high quality support to the county's emerging talented sports performers, enabling them to achieve greater national and international success and, in so doing, to enhance the reputation of Derby and Derbyshire. The programme, which has now celebrated its fifth anniversary, has continued to offer extensive support through expert coaching, bespoke strength and conditioning programmes, physiotherapy and nutritional and lifestyle advice. Lewis White with his bronze medal. In 2016, the DIS was able to celebrate a first medal at Olympic or Paralympic level when teenage swimmer Lewis White, of Swadlincote, claimed a bronze medal in the 400m S9 category at the Paralympics in Rio. The programme has also helped numerous athletes across a wide range of sports move onto a World Class Performance Programme or a professional team, from where they hope to secure more success for Derbyshire. Successful graduates from the DIS programme include the likes of swimmers Molly Renshaw, Abbie Wood (see video below), Sarah Vasey and Imogen Clark, table tennis player Liam Pitchford and cyclist James Shaw. Watch the Buxton swimmer claim a place on top of the podium at 2016 British Swimming Summer Championships at Ponds Forge, Sheffield. With the ongoing expansion of the programme and a new 20:20 Vision leading towards the Tokyo Olympics and Paralympics, the Derbyshire Institute of Sport has now become established as an independent organisation run as a Community Interest Company (CIC). The programme has also realigned to a new structure for the new Olympic and Paralympic cycles with athletes classified into bronze, silver, gold, world class podium potential and ambassador categories depending on their achievements and potential. You can click to find out more about the DIS programme on its new website. University of Derby, Kedleston Road, Derby, DE22 1GB. The Derbyshire Institute of Sport magazine was produced by the Derbyshire Sport team biannually between November 2012 and March 2017. You can read back issues online (most recent listed first) by clicking on the relevant magazine cover.